On a Friday night the place is packed out with everyone from suits, to families and north-shore hipsters. Even though it’s an odd mix it certainly creates an atmosphere – and a buzzing one at that. 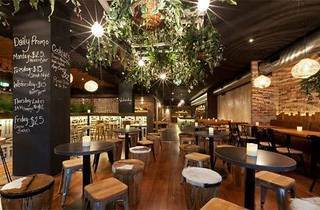 Warm and inviting, long wooden communal tables are candlelit with fake foliage hanging above, contrasted against bare brick walls. Next to the bar a DJ spins pop and house hits that are loud enough to create an atmosphere but not too loud that you can’t hold a conversation. On Sundays, the decks are given a rest in favour of live music. A small nook in the corner that almost looks like your mate's living room with cowhide throws, books and soft leather couches is very inviting. The bar is big, the service is speedy and the good-looking scruffy haired staff are dressed in cute canvas aprons. The Slurpee machines look a bit out of place, churning colourful icy treats. But they are in fact frozen cocktails and the flavours span Icy Lycini, Ribena Berry Punch and Summer Passion. Though they’re more slushie than chic they make a fun addition to the menu. There are also white sangria pitchers loaded with squishy kiwi fruit, tart lime and fruity sauvignon blanc. Drawback is, most of the large pitcher is taken up by ice, only pouring three very-small serves. 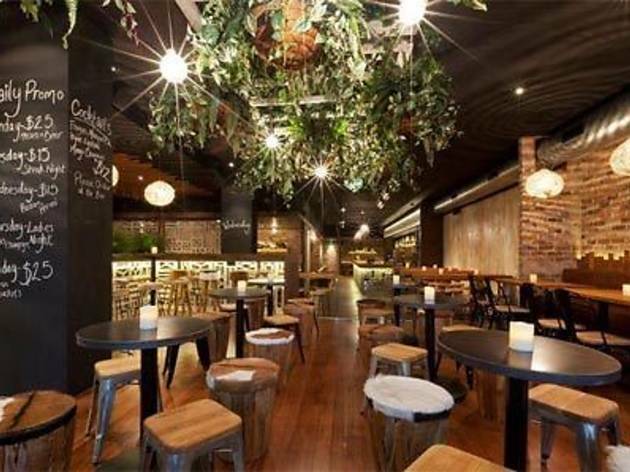 The wine list is made up of almost all-Australian blends but is reasonably priced, with bottles starting at $25 and going up to $70. The pub fare is pretty standard and even though it’s not super cheap, the servings are huge (think pizza-sized schnitzel and towering burgers). Opt for one of the nightly special if you're looking to save. The Stoned Crow brings something different to the area – it was average at best before, but with spruce ‘n’ juice, it’s a solid joint.